Type BA15d: Two contacts, one filament, pins on base are at the same level. Common bulbs with BA15d base including 1056, 1076, 1142, 68, 90, and others. Type BAY15d: Two Contacts, two filaments, pins on base are at two levels. Typical use as automotive tail/brake light but also found in RV on occasion. 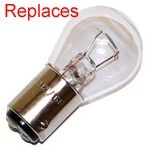 Common bulbs with BAY15d base is 1157, 1034, 1154, 2057, 2357, 1016, 2397 and others.